Lagos-Recife and Lome-Rio de Janeiro are risky routes to launch but if successful they could usher in a new era for the under-served Brazil-Africa market. There is huge potential for new services linking Latin America and Africa but airlines from both sides will need to offer a multitude of connection options and have the right partnerships in place for pioneering routes to succeed. Direct links between Latin America and Africa have traditionally been limited. But the Brazil-Africa market is poised for rapid growth, particularly as the Brazilian government promotes more trade with Africa. Several carriers, including Ethiopian Airlines and Brazil’s Gol, are eager to tap into the growing demand. Ethiopian is launching three weekly flights to Rio de Janeiro and Sao Paulo via Lome on 1-Jul-2013. Gol aims to launch three weekly flights from Recife in northeast Brazil to Lagos in Nigeria by the end of 2013. Other African carriers, including EgyptAir and Nigeria’s Arik Air, are also now studying potential services to Sao Paulo. There are currently only three airlines serving the Brazil-Africa market with non-stops services – South African Airways (SAA), Angola's TAAG and Cape Verde's TACV. Combined, these three African carriers currently operate 19 weekly frequencies to Brazil, including 11 for SAA, seven for TAAG and one for TACV. TAAG serves both Sao Paulo and Rio de Janeiro while SAA only serves Sao Paulo and TACV serves Fortaleza in northeast Brazil. SAA and TAAG are also the only carriers linking Africa with any other Latin American country. SAA currently serves Buenos Aires in Argentina with three weekly flights while TAAG operates one weekly flight to Havana in Cuba, according to Innovata data. Brazil is the natural Latin American gateway to Africa. Brazil has close cultural and historical ties with Africa. Economic links have historically been limited but are growing, driven by Brazilian companies from the construction and resources sectors. The Brazilian government, initially under President Lula de Silva and now under President Dilma Rousseff, has also been promoting in recent years increased trade with Africa. From 2000 to 2011 Brazil-Africa trade increased more than six-fold from only USD4.2 billion to USD27.6 billion, according to a Nov-2012 report from Chatham House. Brazil has seen the second highest growth rate for trade with Africa after China. Gol announced on 28-May-2013 that “it is studying the possibility of opening a new route between Brazil and Nigeria” using its existing fleet of 737NGs. A Gol executive told CAPA that the carrier has been looking at the African market at the request of the Brazilian government. He said the carrier has requested traffic rights to serve Lagos in Nigeria from Recife, initially with three weekly flights. The route could be launched by the end of 2013, particularly if Brazilian corporations and the federal government support the proposed service as expected. Gol is also discussing a potential partnership with Ethiopian Airlines, which plans to initially serve Brazil on an Addis Ababa-Lome-Rio de Janeiro-Sao Paulo-Lome-Addis Ababa rotation. Ethiopian could use feed in Brazil. With TAM in the process of exiting the Star Alliance, Gol would be a logical partner for Ethiopian. Both the Ethiopian and Gol routes have their challenges. Lome is not a major African market for Brazil and Recife is not a major Brazilian market for Africa. As a result Ethiopian and Gol will be banking on a large mix of one and two-stop itineraries to fill their Africa-Brazil flights. In almost all cases their one-stop and two-stop products will offer competitive connection times. A large portion of Brazil-Africa passengers now fly via Europe. Speaking to CAPA at the recent IATA annual general meeting, Ethiopian Airlines CEO Tewolde GebreMariam said the carrier expects only a small fraction of passengers on its new Brazil flights will get off in Lome, which is the capital of the small West African country of Togo. Indeed Togo is a tiny market compared to other West African countries that have strong and fast-growing ties with Brazil. There is limited trade between Brazil and Togo, which has a population of about six million. But Ethiopian through its Togo-based subsidiary ASKY Airlines offers flights from Lome to more than 20 destinations throughout West Africa. Ethiopian will not be able to connect Brazil with all these markets as most of ASKY’s routes are operated less than daily. But Mr GebreMariam said Ethiopian has timed its Tome-Brazil flight to connect with some of the larger West Africa-Brazil markets including Benin, Ivory Coast, Ghana, Guinea and Nigeria. Angola and South Africa are the largest African market from Brazil. But Mr GebreMariam says Angola is not being targeted as it is already served directly from Brazil. TAAG currently serves the Luanda-Sao Paulo and Luanda-Rio de Janeiro routes with four and three weekly Boeing 777 frequencies, respectively. South Africa is not being targeted as SAA already operates 11 weekly flights from Johannesburg to Sao Paulo. ASKY currently does not serve Luanda or Johannesburg but has been looking at adding both destinations to its fast-growing network. Ethiopian will also offer a wide array of East African connections to Brazilian passengers as the Brazil-Lome flight continues onto its Addis Ababa hub. The Ethiopian group currently has the largest African network. Ethiopian currently serves about 40 destinations in Africa, excluding domestic destinations in Ethiopia and the destinations served by ASKY. Ethiopian will also offer connections in Addis Ababa to China, where it serves Beijing, Guangzhou, Hangzhou and Hong Kong. China-Brazil is another fast growing and under-served market. Brazil to China on Ethiopian will require two to four stops but the transit times in most cases will be unbeatable given the lack of direct services in the market and the fact that Brazil-Africa-China is a much shorter routing than Brazil-Europe-China and a slightly shorter routing than Brazil-Middle East-China. Air China currently serves Sao Paulo via Madrid. But the biggest competitors in the Brazil-China and broader Latin America-Asia markets are the Gulf carriers. The competition in the Latin America-Africa market is not as intense because Gulf carriers are unable to serve most of this market without significant backtracking. Ethiopian’s biggest challenges in making the route work will be on the Brazil end. Ethiopian is an unknown brand in the Brazilian market. With most Brazil-Africa passengers of Brazilian origin, Ethiopian would benefit from having access to a Brazilian carriers’ distribution network. The circle routing combining Rio de Janeiro and Sao Paulo is also less than ideal. Mr GebreMariam expects most of Ethiopian’s Brazil passengers to get off in Sao Paulo, saying Sao Paulo is the main destination and the decision to go with a circle routing rather than a tag was driven by slot limitations at Sao Paulo. But Mr GebreMariam said the carrier hopes to develop the Rio de Janeiro market over time. He said Ethiopian will focus on adding capacity to its two Brazil destinations rather than launching other new markets in Latin America. Ethiopian’s focus on Sao Paulo and Rio de Janeiro as its gateway to South America further underscores the need for the carrier to secure a local partner. The right connections at Rio de Janeiro Galeao and Sao Paulo Guarulhos would help Ethiopian fill its 787s. Gol has a large domestic network at both airports and also operates regional international flights to destinations such as Buenos Aires and Cordoba in Argentina, Santa Cruz in Bolivia, Asuncion in Paraguay and Montevideo in Uruguay. Guarulhos is Gol's largest hub while Galeao is the carrier's fourth largest hub. Connections will also be critical for Gol’s planned Recife-Lagos service. Gol is already the largest carrier at Recife, serving nine domestic destinations including Rio de Janeiro and Sao Paulo. 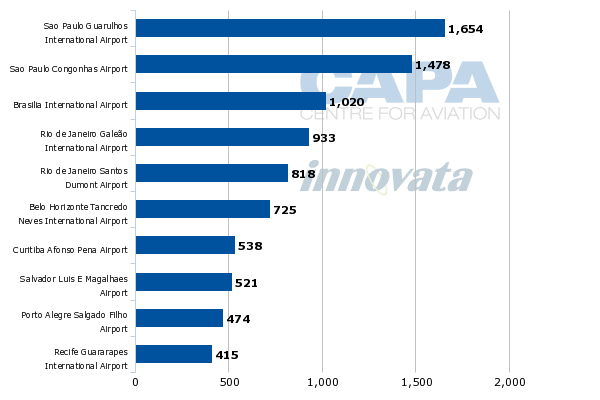 Gol currently operates over 400 weekly flights at Recife and accounts for a leading 37% of total seat capacity at the airport, according to CAPA and Innovata data. Recife is Gol's 10th largest base. 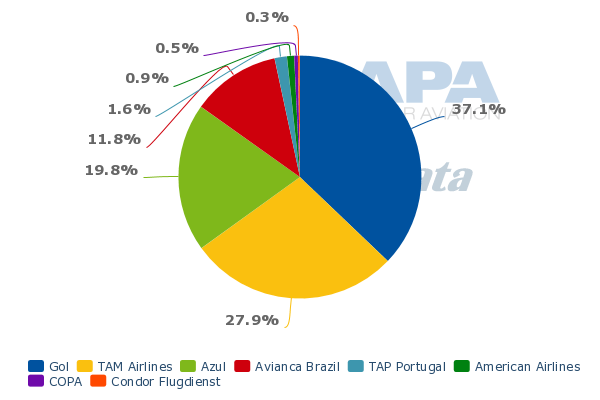 Recife currently has only four international services – Lisbon (served daily by TAP Portugal), Miami (served five times weekly by American Airlines), Panama City (served four times weekly by Copa Airlines) and Frankfurt (served once a week by Condor). Gol does not expect a larger number of Recife origin or destination passengers for Lagos or any other African route. But it sees value in offering a one-stop product to West Africa from Sao Paulo, and to a lesser extent other major Brazilian cities. Sao Paulo, the largest city in Brazil and the financial centre, is by far the biggest source of passengers in Latin America for Africa. Gol has adopted a similar strategy to developing a network in the US, where the carrier began serving Orlando and Miami in Dec-2012 from Santo Domingo in the Dominican Republic. At Santo Domingo, Gol offers connections to Rio de Janeiro and Sao Paulo. Gol is now working on establishing a subsidiary in the Dominican Republic, which would allow it to lower its costs on the Santo Domingo-Florida sectors and launch additional services. The Gol executive tells CAPA that the carrier is currently evaluating Boston as a potential third US destination that would be served from Santo Domingo. It is also looking at using Gol Dominicana to offer flights to other Caribbean destinations, starting with Havana in Cuba. The distance between Recife and Lagos, about 2,400nm, is about 400nm shorter than Sao Paulo-Santo Domingo, which is Gol’s longest route. Recife could potentially become an African hub just as Santo Domingo is emerging as Gol’s hub for North America and the Caribbean. These hubs are not about local demand but about exploiting their geographic position to support narrowbody services in markets which otherwise would require widebody aircraft. Gol has no intention of resuming widebody services but sees an opportunity to stimulate demand in markets that are currently not penetrated by LCCs by offering a competitively priced one-stop product using its all-737NG fleet. Gol is not looking at establishing a subsidiary in Nigeria like it is in the Dominican Republic. But it will need to leverage Lagos’ position as a West African hub for the Recife-Lagos route to be successful. There is a relatively large amount of traffic between Nigeria and Brazil. But Nigeria is not as big a market for Brazil as Angola or South Africa and is probably not large enough to entirely fill up even a 737. Gol will also need support from Brazilian corporations that do business in Africa. Brazil has successfully penetrated the corporate sector by adopting a hybrid model and offering a frequent flyer programme, which it inherited from its acquisition of Varig in 2007. But Gol’s all-economy product may not be well received by business passengers on flights as long as Sao Paulo-Recife-Lagos. Gol will ultimately need to stimulate significant demand from the leisure and visiting friends and relatives sector. Stimulating demand on the West Africa end may be particularly challenging but is feasible given the region is under-penetrated by LCCs. Nigeria is currently not served by any LCCs. In West Africa the LCC penetration rate of about 3%, which is starting to rise as new pan-African LCC group Fastjet expands from its initial base in Tanzania. In comparison, the LCC penetration rate in Brazil is over 50% (includes both domestic and international capacity). But Gol’s expansion into Africa is risky and comes as other Brazilian carriers are reluctant to meet the government’s request for more direct links with Africa. A TAM executive told CAPA that the carrier has no intentions of serving Africa. Brazil’s largest carrier is instead now working on implementing a new codeshare with SAA. Brazil’s second full-service carrier, Avianca Brazil, was keen on launching services to Africa back in 2007, when it added widebody aircraft in the aftermath of the Varig collapse. Avianca Brazil, which at the time was known as Ocean Air, identified Angola, Nigeria and South Africa as markets for its new long-haul operation. But the Africa plans were put on the backburner in 2008 as Ocean Air restructured, phasing out its 767s and focusing entirely on domestic services. Avianca Brazil currently only operates domestic services. One of the carrier’s executives told CAPA that it is not currently looking at serving the African market and doubts that Gol will be able to make the Recife-Lagos market work. Gol, however, should be applauded for its apparent willingness to experiment with new routes. Ethiopian also deserves a lot of credit for opening up new Brazil-Africa connections. With the right distribution and partners, Lagos-Recife and Lome-Rio de Janeiro/Sao Paulo could prove to be successful. Several carriers could quickly follow the lead of Ethiopian and Gol.